"Isn't she sick? I thought sick people sometimes make things up." In what is purported to be his final theatrically released film, director Steven Soderbergh returns to familiar territory with his latest thriller Side Effects. Working from a script from Scott Z. Burns (Contagion), he has concocted a well-oiled mystery that doesn't let up once it gets going, proving that he's one of the more underrated directors working today. It seems odd to call an Academy Award winning director underrated, but because Soderbergh has proven to be such a chameleon in his film choices, he is rarely brought up in the discussion of great directors. He's a true journeyman, working in multiple genres, styles & even technologies, always cranking out solid films and Side Effects is no different. Emily (Rooney Mara) is going through some turmoil in her life. Her husband (Channing Tatum) is about to be released from prison for insider trading, and she seems like she's barely able to hold things together. After a failed suicide attempt, she meets with Dr. Jonathan Banks (Jude Law) who prescribes her some anti-depressants. Not feeling any better, Emily asks to be placed on a new drug called Ablixa. The drug seems to have helped her turn the corner on her depression, but brings with it the nasty side effect of sleepwalking. Her husband is not convinced he wants his wife on the medication,but she says she's never felt better. Dr. Banks decides to keep her on the medicine, but when she commits a horrendous crime, his entire medical practice falls under scrutiny, and he finds himself in danger of losing everything. I'll try to keep this as spoiler free as possible, though I fear I've already said too much. If you've seen the advertisements for the film, it's not hard to glean what she does, and it wasn't a huge surprise for me, but it caused lots of gasps from the audience at my screening. At first, the film seems to be heading straight towards becoming a screed against the pharmaceutical industry, but Soderbergh & Burns are smart enough to skirt that territory. That material has been covered before, phenomenally well, in The Constant Gardener, and doesn't need to be rehashed. It's merely a gateway into a much simpler pot-boiler. The film is extremely well made, keeping you constantly guessing what characters' motivations are and who has an advantage over whom at any given moment. It's the kind of film that doesn't get made much anymore, mainly because it's so small and I don't mean that as an insult. In the late 70s and early 80s, directors like Brian DePalma, Alan J. Pakula, Sidney Pollock & Sidney Lumet routinely churned out entertaining whodunits, and that just doesn't happen much anymore. Too often now, audiences rely on twists & turns & big reveals that inflate otherwise slight material into self-important nonsense. While Side Effects certainly has its faults, it doesn't hinge on twists to keep it afloat. The reveals are done in classic mystery style, with clues leading to revelations. There's no big "pull the rug out from under the audience" moment that collapses everything, it all fits together quite well. The performances from the leads are all particularly good. 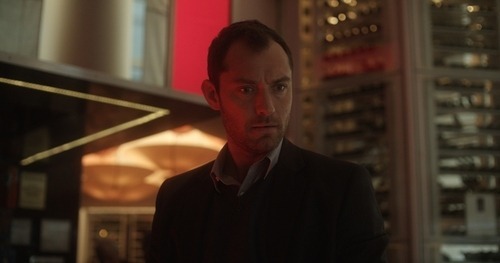 Jude Law is the sort of actor who is at his best in roles like this, where he's morally ambiguous and the audience isn't sure whether or not to root for him. His best work has come from him playing dubious characters such as he played in I Heart Huckabees or The Talented Mr. Ripley. Directors who tried to cast him as an everyman or a dashing lead have worked him against his type, and it's nice to see him working with a director who knows how to utilize him properly. Rooney Mara is also very good, building on her outstanding performance in The Girl with the Dragon Tattoo. She knows how to inhabit a character and similarly make them fleshed out but still morally ambiguous. I would love to see the film again and contrast her scenes early in the film with the work she does later in the film. Tatum is perfectly serviceable in his role, as is Catherine Zeta-Jones as Emily's old therapist. It's a well put together ensemble, but Law & Mara really shine in their roles. If you're looking for a good old fashioned mystery that flies by in about an hour and forty five minutes, Side Effects is a pretty damn good film. It will keep you engaged with its interesting characters & fine performances, and it might well be your last chance to see a Steven Soderbergh film on the big screen (his LIberace biopic is set to debut on HBO later this year). It's certainly the best film I've seen so far in 2013.